"The Man With the Wet Thumb"
Come on in or give us a call at the gardens for a quote. With a lifetime of experience, William C. Uber is one of America's foremost authorities on all facets of water gardening. He is a third-generation owner of the Van Ness Water Gardens in Upland, California, a leading provider of fresh water aquatics with clients from around the world. His company is a grower, wholesaler, retailer and mail-order operation. The firm also has an extensive e-commerce web site. Products, plants and fish are provided to do-it-yourself homeowners as well as landscapers and commercial projects. Uber has considerable experience providing consultation services to landscape architects, estate managers, golf course and park superintendents as well as individual homeowners (see attached list of consultation clients). His expertise includes site selection, pollution control and abatement, ecological balance, water chemistry, water feature construction, pond repair or restoration, aquatic plants, common pond fish and fish health, drought conditions, marsh and wetlands conditions, cleaning and maintenance techniques, soil conditions, algaecides and herbicides and more. He also holds a certificate in Fish Health Management from the University of Georgia College of Veterinary Medicine. Van Ness Water Gardens has introduced many of today's best-selling water lilies to the horticulture trade, including Nymphaea 'Green Smoke", N. 'King of the Blues', N. 'Tina' and N. Makenna'. Uber has been a guest lecturer for many college courses at such institutions as Cal Poly, Pomona, UCLA, UCR and local community colleges, as well as presenting programs and seminars for trade associations, garden and fish clubs, and civic organizations. He has been a guest on numerous radio and television programs. Van Ness Water Gardens has hosted field trips and tours for horticulture classes, nursery association groups and community organizations. Uber is a past president of the California Association of Nurserymen, Inland Chapter. 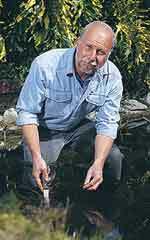 William C. Uber has a particular interest in developing solutions and innovative techniques for unique water scaping situations. His consultation practice has developed over the years to include providing his expertise for public water features such as golf courses, theme parks, wetland conservatories, shopping malls, hotels and public gardens and parks. He also provides consultations for private estates and property management firms. He has directed the construction, planting and maintenance of ponds, waterfalls and fountains for both private residences and public entities. To schedule an appointment for a consultation, please contact Van Ness Water Gardens at (800) 205-2425 or email ponds@vnwg.com. The following is a partial list of organizations and institutions that have received consultation services from William C. Uber. William C. Uber is the third-generation owner of the Van Ness Water Gardens in Upland, California. He has a lifetime of experience with all facets of water gardening, ponds and commercial water features. Uber provides consultation services to landscape architects, estate managers, golf course and park superintendents as well as individual homeowners His expertise includes site selection, pollution control and abatement, ecological balance, water chemistry, water feature construction, pond repair or restoration, aquatic plants, pond fish and fish health, drought conditions, marsh and wetlands conditions, cleaning and maintenance techniques, soil conditions, algaecides and herbicides and more. He is also certified by the University of Georgia College of Veterinary Medicine a Koi Doctor and Fish Health Management specialist. Uber is the author of The Basics of Water Gardening (Dragonflyer Press).